"Indigenous disadvantage remains a problem for Australia despite the national apology..."
Archived transcript from the ABC program George Negus Tonight, broadcast 5 June 2004. 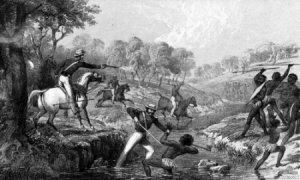 "In this story we hear the stories of indigenous Australian soldiers – the forgotten diggers and hear what it was like to go to war as a black Australian and how this experience led them to agitate for rights at home." Draws attention to the performance equality of Aboriginal soldiers who served at Gallipoli but notes their unequal treatment when they returned to Australia. Also comments on the difficulty in estimating the number who took part. Site temporarily unavailable 2 Apr 2019. "Aboriginal people have represented Australia in every single conflict since the Boer War, but they have been rarely recognised and celebrated..."
Transcript of television program. "As thousands lined the street to watch today's Anzac Day parade, there was one small group marching to remember diggers who have been forgotten by this country. Hundreds of Aboriginal veterans are buried without military recognition..."
Attempt to have the contributions of some Aboriginal soldiers recognised. At least 65 Victorian Aboriginals volunteered for World War 1. ● Dr Brendan Nelson (Director, Australian War Memorial), National Press Club Address, 18 Sep 2013. Scroll down a little more than half way for the question from Michael Brissendon commencing "Dr Nelson, just a reflection..."
Broadcast 22 October 2010. Online video of TV report about "Forever Warriors", a new book on Western Australia's Aboriginal soldiers by Jan "Kabarli" James. "Pays tribute to the sacrifices of Aboriginal soldiers who fought for Australia only to return home to racism and discrimination." Online video expires 20 January 2011. Bibliographical details of Forever Warriors: Trove (National Library of Australia).